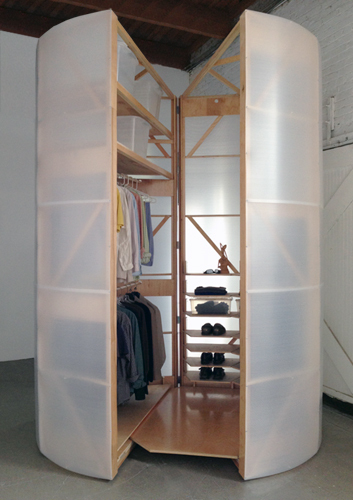 The tuberoom, which was designed to be easily outfitted for a variety of activities, is pictured here as a 10’ tall, 6’ diameter walk-in closet. 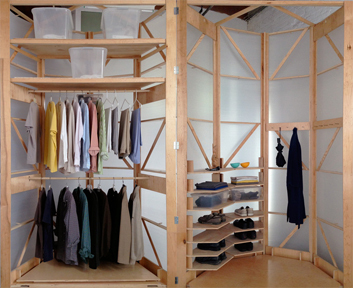 This is the equivalent of a 24’ wide standard closet with a dressing area. 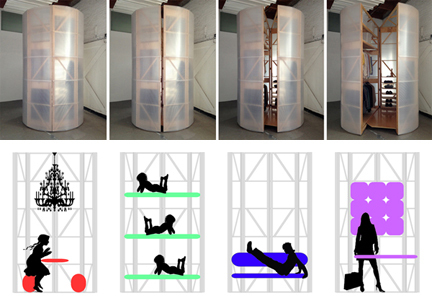 The tuberoom design is a circular wall system on wheels that is lightweight but also structurally robust. It can hinge open or be fixed and fitted with a doorway. The design works equally well scaled up or down and since the plywood lattice provides all of the support the skin can be any material to fit your light, sound and aesthetic requirements. As an addition in an industrial loft, a tuberoom which delineates a use while preserving a flexible open plan, fulfills the functions of architecture while not requiring building permits. In historically sensitive buildings this type of design approach can provide supplemental function quickly, where even simple alterations involve a lengthy wait and a pile of paperwork. The tuberoom was featured on designboom, the digital architecture and design magazine with a readership of over 4 million people per month, and MocoLoco, a web magazine devoted to modern contemporary design and architecture.